Here lies a post about the last book I read for my Year of Reading at Your Mercy. (Better late than never. At least, that’s a phrase I’m hoping you will buy.) This book was last but not least, because it was Eva’s pick and the only book I read aloud with someone else. We finished it the last day of my birth month, May 31, and I love how fate worked so that I started the challenge with David and ended it with Eva. Eva’s school had a book fair last spring, and she chose her pick from among the tables and cases full of shiny, new books and marginally related yet eye-catching, kid-dazzling merchandise. 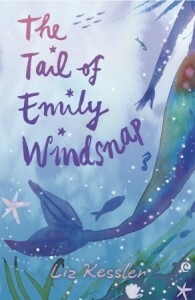 It is The Tail of Emily Windsnap by Liz Kessler. It came in a gift set with its sequel (and a shell necklace!). The story follows a girl—you guessed it, Emily Windsnap—who discovers a startling secret about herself when she attends her first swim lesson. (Think hard here and I bet you can come up with a few good guesses about what the secret is.) Afterwards, a whole new world opens to her, but it comes with knowledge that has the potential to either ruin her family or save it. Eva loved this book before we even breathed word one. Her enthusiasm only waned a small moment when she realized it wasn’t a book with pictures on every page. She recovered quickly. Eva followed the story really well, even though she had to concentrate harder than usual to keep up. I sometimes reminded her to ask questions if she didn’t understand a word or something, and she would usually speak up. We’d read a few chapters every other night or so, and she never lost interest, always wanted to keep going past bedtime. Soon enough, she started making predictions about the characters, especially about who or what Mr. Beeston, the antagonist, really was. (Eva delights in villains. She calls the bad cards in Uno—the skips and reverses and draw-twos—villains and relishes wielding them with squinty eyes.) She was convinced that Mr. Beeston had killed the real lighthouse keeper, had “put on his skin,” and was pretending to be him, although that’s much more sinister than Kessler actually takes the story. As far as covering new ground for Eva goes, we discussed the concept of illegal marriage—after all, did you know mermaids are imprisoned for loving humans? Imprisoned for life. (This discussion was pretty timely, considering the abysmal law just passed in our neighboring state of North Carolina.) Eva was also confused as to why people would live on a boat, like Emily and her mom do. Below is a list of some of the words Eva asked about. (At times, I was obsessive enough to jot them down. What can I say? I’m a nerd.) I know she won’t remember all of them off the bat, but they’re coins in the fountain, right? How did I like the book? Well, I loved reading it with Eva. I loved hearing her laugh when something silly happened or fret when things weren’t looking particularly safe for Emily. I loved when she’d bring it up out of the blue, exclaiming to her daddy, random stuff about the plot like, “The poison was in the donuts!” She made the book into a game at the pool one day. I had to be Emily and she was Shona, Emily’s best friend, a life-long mermaid, and therefore more authentic in Eva’s eyes. (David had to be Mr. Beeston and chase us with his eyes closed.) As much as I loved reading this book with Eva, though, it isn’t one of those children’s books I would have kept reading on my own. Emily’s problems were too easily fixed for my taste, and some of the minor characters were too vague or too “stock.” But I don’t think the book was meant for my eyes, and I’m glad I got to follow along anyway. I’ve never read water like this before. Warm and seeping chocolate. Water probably would feel different to a mermaid, and now I think I’d like a tail too. Just for a little while. And I would swim far, far down and deep with Eva wiggling right beside me.